Want to give it a try? Read our Getting Started guide. Phaedra is 100% open source and is composed of many first-class open source libraries and projects. The primary technology used in Phaedra is the Eclipse platform. Using the familiar concept of an Eclipse workbench, Phaedra adds dozens of views that respond to each other's selections, form editors with input validation, an extensive and deeply configurable charting framework, scripting integration and more. HCS is all about digital imaging, and those images are large and numerous. Phaedra solves this problem by using JPEG2000 technology to compress, store and render those images efficiently. Compression factors are significantly higher than in traditional jpeg or gzip compressions, and the ability is preserved to render images - or regions of images - at any size, directly from the compressed file. This magic happens with the help of the OpenJPEG project, the reference implementation of the JPEG2000 standard. It allows Phaedra image viewers to offer real-time zoomable and scrollable renderers, again with full interactivity. A user can e.g. 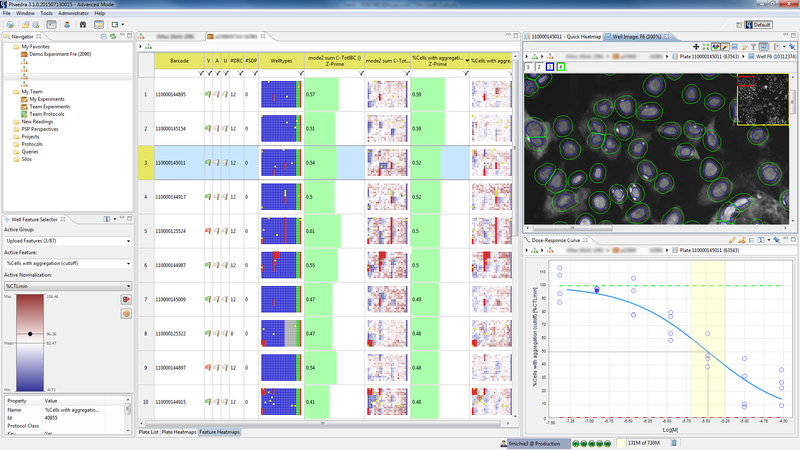 select a group of cells on an image, and immediately plot the properties of those cells in a 1D, 2D or 3D chart. Phaedra is freely available and released under the terms of the Eclipse Public License version 1.0. The sources are published on Github.